Greenwald Carpet & Fabric Stain Remover works really well. 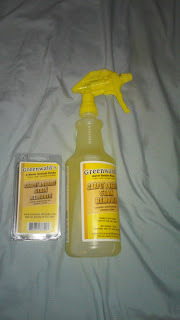 I used this on my steps where my child had spilled there red juice and it can up I was so surprised. I will continue to use this around the house for all the stains that my children make on my carpet and furniture. It also smells really well there is not bad smell to it that would hurt your nose from smelling it.